Dan Kneen is among the leading contenders at this weekend's Armoy Road Races. Dan Kneen has the rostrum firmly in his sights at this weekend’s SGS International Armoy Road Races as the Mar-Train Yamaha rider continues his comeback from injury. Kneen was ruled out of the North West 200 and Isle of Man TT after breaking his arm in a mountain bike accident. The 29-year-old made his return at the Southern 100 earlier this month and is building towards next month’s MCE Insurance Ulster Grand Prix, where Kneen clinched a memorable victory in the Superstock race in 2014. He made his debut at Armoy two years ago and finished on the podium in the feature ‘Race of Legends’ – a feat Kneen is eager to repeat on Saturday. “I’m feeling good about this weekend – we’ve had some time on the bikes and I was out at Scarborough again last weekend, so I’m starting to feel sharp again,” he said. “My wrist is feeling a lot stronger than it did at the Southern too so I’m really looking forward to riding the Mar-Train bikes again. Kneen may have missed out at the North West and TT, but the Isle of Man rider boasts an excellent record on the Mar-Train Yamaha machines this season, claiming 14 podiums from 16 races. Home hero Michael Dunlop sets the standard in the Superbike class at Armoy but Mar-Train team owner Tim Martin is confident Kneen will be right in the hunt on the R1 and is also optimistic of his rider’s chances in the Supersport class. 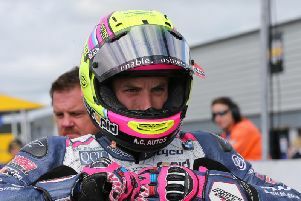 “It was nice to get back to racing at the Southern but Dan has had another couple of weeks rest now and a good few miles on the bikes, so hopefully we can be a bit closer to the wins this weekend,” he said. “There are some exceptionally fast locals to beat at Armoy obviously but both Dan and the R1M have been on the podium at the event before, so there is no reason why we cannot be in the mix on the big bike. “The 600 again should be easier on Dan so hopefully we can take the fight to William and get ourselves back on the top step of the podium,” he added. Roads close on Friday at 12 noon for practice and qualifying with the First4Printing Supersport 600 taking place during the evening. On Saturday, roads close from 10am for the main race schedule.